The Academy Awards are this Sunday, and there’s already been a ton of buzz about who potential winners will be and even what the celebrities will wear. 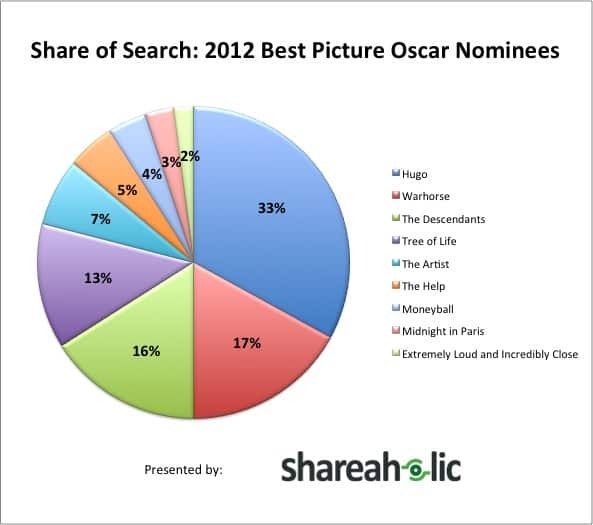 Although internet-savvy movie goers may have slightly different taste than The Academy who actually selects the winners, we thought it’d be fun to show who the potential winners are according to their popularity in internet search. 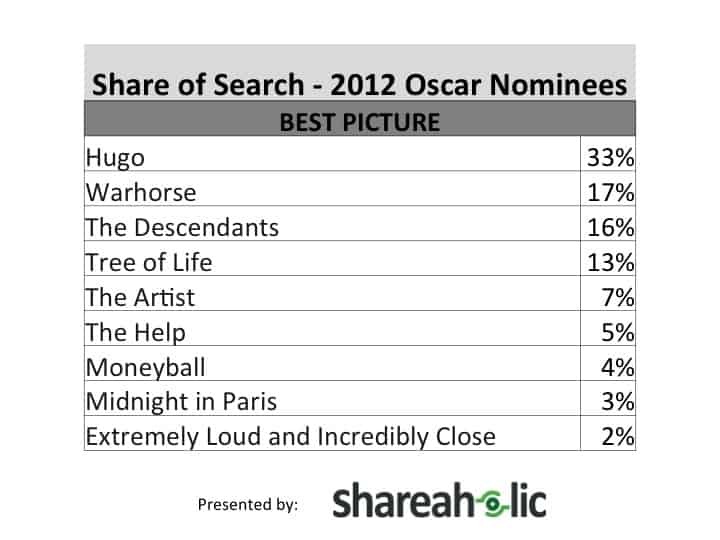 Our statistics, based on aggregate search data from more than 270 million unique monthly readers reached by more than 200,000 Shareaholic publishers, reveal that Hugo is favored for Best Picture with 33% of searches, while Warhorse, The Descendents and Tree of Life follow closely behind at 17%, 16% and 13% respectively. 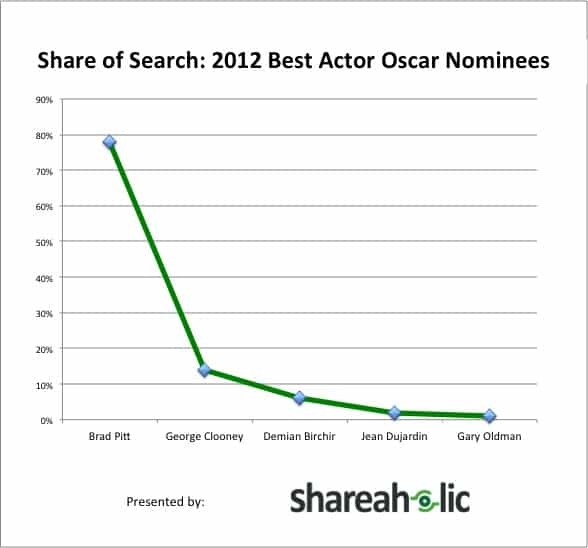 For Best Actor, Brad Pitt was above and beyond the clear winner for his role in Moneyball with 77% of the searches compared to the other nominees. 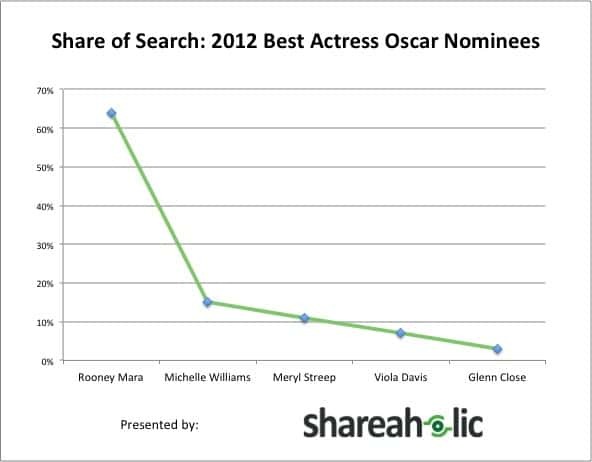 The Girl With The Dragon Tattoo’s Rooney Mara snagged 64% of searches, making her the clear favorite for Best Actress. 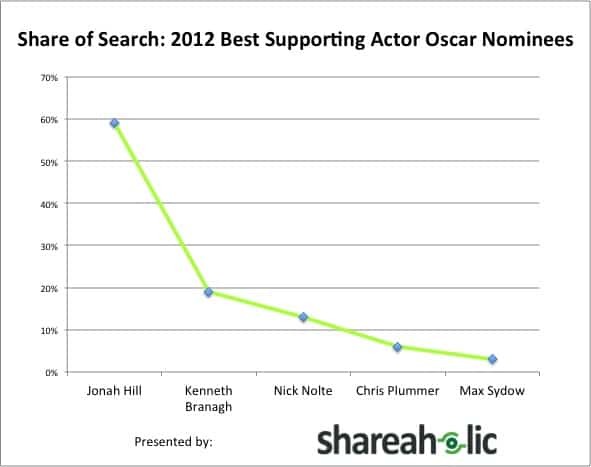 Moneyball’s unexpected nominee Jonah Hill (that guy from Superbad) was the Best Supporting Actor favorite with 59% of searches. 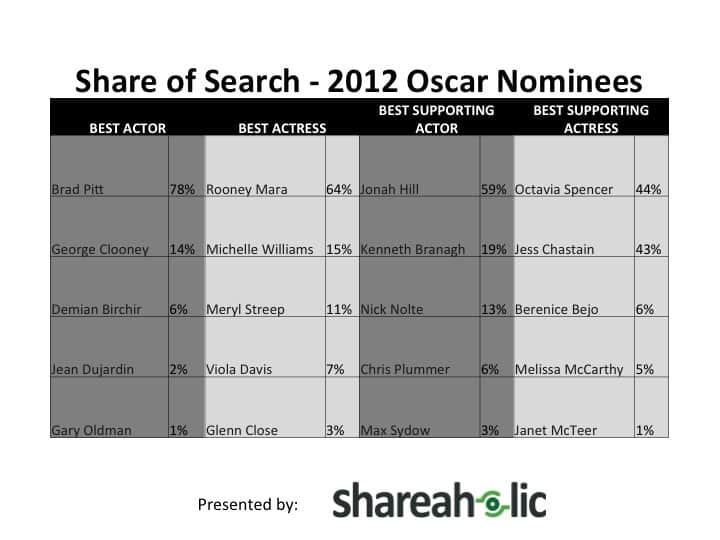 For Best Supporting Actress, Octavia Spencer’s funny and genuine performance in The Help earned her 44% of searches. Do you have any favorites? I’m no movie expert, but you don’t have to be one to recognize that Rooney Mara was completely awesome in The Girl With the Dragon Tattoo. So I’m with the internet on that one – definitely hoping to see her win. Let us know your favorites and reactions in the comments! Next week is Shareaholic’s Monthly Referral Traffic Report. Be the first to get it in your inbox – Sign up for Shareaholic.